Maryland Motocross.com: Hello Cheryl it’s Vance from MarylandMotocross.com, got time for an interview? MM.com: First off, how old are you and how long have you been riding? MM.com: Is there any significance to your number, #198? CM: I was going to a National and I had to pick a number, I wanted 199, but they didn’t have it, so I went with 198 and I’ve had it ever since. MM.com: Exxxxxxcellent. Your dad is the President of the (M.A.M.A.) Middle Atlantic Motocross Association right? MM.com: All right, So would you consider yourself - A) The first daughter - B) A M.A.M.A.’s girl - C) my new girlfriend - D) none of the above? MM.com: Well, I had to try. MM.com: So, what would you say is your best moment in MX? 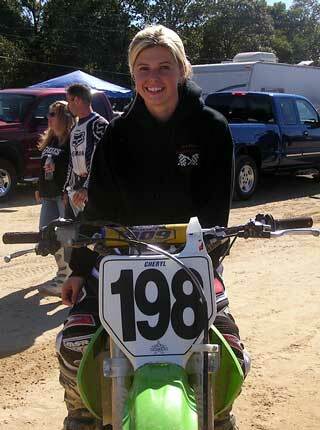 CM: When I won a National at Broom Tioga, NY. MM.com: Is it ever intimidating or do you ever feel like they don’t want you there when you race against boys? CM: No, not really. I kind of like to ride with the boys better because they kinda make me faster. More aggressive. MM.com: Oh, I see. Now flip the tables, what have you noticed or seen after you’ve beaten them? CM: Well sometimes they get kind of upset and have like a big attitude about it. MM.com: M.A.M.A.’s Ball is coming up soon, are you excited about it? MM.com: Hold on for a sec. (Shouting) Ese’s it’s called the M.A.M.A.’s Convention you loon. Ese’: (Shouting from kitchen) shut up Chicken Gizzard boy. MM.com: Whhhhhoooooaaaa! You’d better chill out lil’ Thundercat. MM.com: If you could change anything about MX, what would it be? CM: I really don’t think I would. I mean there’s nothing that I don’t really like about it. MM.com: What kind of bike(s) do you ride and what kind of gear do you wear. 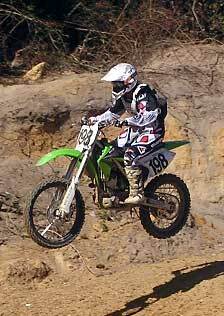 CM: I ride a Kawasaki 250F and I wear MSR. MM.com: I noticed that you have pretty hair and Dermatolologically we should all moisturize, I’d like to know what kind of shampoo do you use and do you rinse, apply, rinse, repeat or do you rinse, apply, rinse some leave a little conditioner in? CM: Various shampoos and the second method. MM.com: I’ll keep that in mind. Now, what goes through your head when you are on the line and/or when the gate drops? CM: Line: To the best that I can and to hit every corner fast and when the gate drops to try to get the hole shot every time. MM.com: What’s your favorite track to ride at and your favorite event to attend each year? CM: My favorite track is Virginia Motorsports and my favorite event is Budd’s Creek Nationals. MM.com: Do you have any hobbies besides Motocross? CM: Not really, I cut hair. MM.com: Interesting. Rumor has it that you had a longstanding affair with Captain M and it ended when he left to go fight in Iraq. CM: (Laughing) What!!?? I have a love affair with whooooo? MM.com: You’re not trying to deny it are you, cause THE NILE, Cheryll, is not just a river in Egypt. MM.com: So I guess it’s no comment then? CM: (Laugh, Amused) No comment. CM: To basically just have fun and not get too serious. MM.com: Now, when we come to MAMA’s house what should we wear? MM.com: The Award thing. Is it like a black tie affair? CM: Oh the Banquet. Probably nice pants and a tie, but nothing more than that. I wish it was a black tie affair, but it’s not. MM.com: Sweet. Could you beat Ese’ or Kevin Duffy in a race? I wasn’t going to say anything but they were talking some smack about you. MM.com: The guy with the camcorder. CM: Oh okay, Yeah I could probably beat them. MM.com: Kevin supposedly was pretty good and I’ve seen Ese’ on a bike once and he was in first the whole time (gear that is), so what do you think? CM: I’d still say probably. MM.com: Who would you say is your best friend in Motocross? CM: I would have to sayyy… Jessye Davis. MM.com: You call her peanuts? MM.com: Okay Cheryll, look for Ese’ and Kevin at the MAMA’s errrrrr… thing. So make sure you stop at their red carpet and do a little interview. And once again, congratulations on being the Women’s Champion. CM: I will and thank you.